Playing online game Mobile Legends need internet promo, with Smart you can register for their various data offers with up to 30 days validity. For now there’s no specific keyword that is internet for Mobile Legends app access only, you need to avail surfing promo. We will help you choose the best possible offer that you can subscribe using your Smart / Bro prepaid SIM. 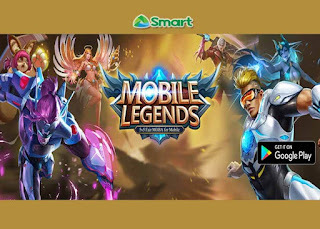 Mobile Legends require stable and low ping internet connection so it’s better to connect with LTE network to get high speed mobile internet. Don’t worry if your phone and location is not yet 4G/LTE ready, you can still play the game even on the 3G/HSPA+ internet as long as it’s stable. Just choose any of the listed offers depending on your budget and needs. You can register daily, weekly and even monthly to avoid hassle on registration procedure. Do note that Smart promos usually need P1 maintaining balance to continue using any of the promos you subscribed. Smart Bigbytes 70 or BIG 70 – you’ll get 1GB of day for 7 days with free 300MB for a selected video streaming app like Youtube, Vimeo etc. It has free 1000 Trinet texts (Smart, TNT and Sun Cellular) for only 70 pesos. Gigasurf 50 – with your 50 pesos, you can enjoy 3 days internet validity for your 1GB allocated data. Also comes with free 300MB for streaming using selected apps. Available to Smart prepaid, postpaid and Smart bro subscribers. Surfmax 995 – 1 month internet surfing promo for only 995 pesos. You have a daily 800MB data that you can use to play Mobile Legends game for 30 days. Smart GameTime Promo - with 50 pesos for 7 days and Php100.00 for 30 days access to ML. Talk N Text users can register to TNT ML10 Promo - 3 days App Access for only 10 Pesos. My best choice is promo no.1, it’s the cheapest offer with longer validity for you 70 pesos. It will last up to the expiry date if you know to use your data wisely and if you’re only using that to play Mobile Legends. Each of the 3 mentioned promo has other denomination, just check the respective link to know the other amount offers. On successful registration, you’ll receive an SMS notification that includes the details of the promo you subscribed. You can use any of the promo on smartphone, tablet, 4G/LTE modem, pocket Wi-Fi and any other internet capable devices.